The year can be thought of as a cycle. We will start the year in the orchard with Spring, the season of rebirth. When Spring arrives it seems as though dozens of tasks need to be done at once to get ready for the growing season. Pruning which has been going on all winter needs to be finished. Brush which has accumulated beneath the trees as a result of pruning is raked into row centers and chopped or pushed into piles and burned. Fertilizer is spread underneath every tree according to leaf and soil analysis. New trees are planted. Scion wood from desirable varieties may be grafted to existing trees of less desirable varieties as a quick way of making the varietal change. Then comes bloom, the real beginning of the apple growing process and an event that excites the veteran grower and the novice alike. We depend upon bees to carry pollen from one flower to the next so that apples will develop. With most varieties, pollen must come from a different variety in order to get a good fruit set. If you plant a seed from a McIntosh apple, it will not produce a McIntosh tree because the pollen that fertilized the flower was probably not from a McIntosh flower. There are native bees and other insects flying during bloom, but in order to ensure that we have adequate pollination, most apple growers lease hives of bees from a beekeeper during bloom at the rate of approximately one hive per acre. In addition to an adequate number of bees, good pollination weather is necessary to have a good fruit set. The honey bee is particular and does not like to fly if the temperature is below 60 degrees or if it is very windy. The cold, rainy, or windy weather has kept many a good bloom from living up to its potential to produce a good crop. Apple growers spend lots of money to lease hives of bees, wish for really good pollinating weather, and then they wander around the orchard after bloom wondering if perhaps the fruit set is too good. How can the fruit set be too good? Too good a fruit set results in lots of small apples. Each bud opens to reveal a flower cluster of five blossoms. There is one large central blossom called the king with four somewhat smaller ones around it. The king will make a larger apple than the other blossoms. Ideally, growers would like just the kings to set fruit and during a good bloom, and only a relatively small number of those. Apples should be spaced every four or five inches along a branch. It is more desirable to have the strength of the tree go into growing a moderate amount of large apples than a lot of small apples. A bushel of large apples may be worth twice what a bushel of small apples is worth so that it matters a lot that too good a fruit set not be allowed to remain. Thinning is the solution. Thinning is usually accomplished by chemical means. There are a few chemicals that if applied shortly after bloom will cause a percentage of the little apples to drop from the tree. The difficult part of this process is the decision concerning how much to thin. Right after bloom it always looks as though almost every blossom cluster has produced five little apples. It hasn’t, but it takes a few weeks to tell which are going to develop into apples and which are going to shrivel up and fall off. This falling of unpollinated applets is called “the June drop.” In Maine, it happens in early July. Therefore the decision to thin has to be made several weeks before one can really know how much thinning is needed. An educated guess is made based on the number of flowers, the weather, and temperature during bloom and how active the bees were. If the educated guess wasn’t quite right or if weather conditions weren’t conducive to effective thinning, growers may hand thin in July when the apples are about an inch in diameter. Thinning also promotes return bloom. Many apple varieties have a tendency to produce an apple crop only every other year. Thinning counteracts this tendency. Pest control starts in the spring and continues throughout the summer. It will be discussed at some length in a later section. 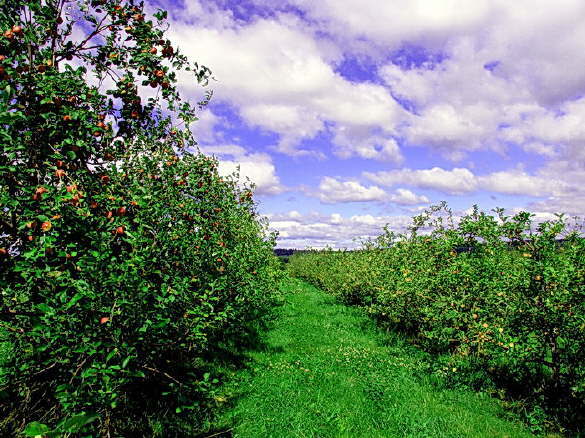 During July and early August, the orchard is mowed at least once, usually twice. It is a job like house cleaning, never ending and as soon as everything has been mowed once it is time to start over again. Weeds right under the trees are considered pests because they use water and nutrients needed by the trees, and they harbor insects harmful to the tree or fruit. They are particularly bad competition for young trees. Weeds are mostly kept under control by the use of herbicides, but other means are available such as under tree cultivation and mulches. A clean strip under the trees reduces rodent habitat. In July and August, many growers have crews doing summer pruning in which the cuts are restricted to new upright growth no greater than three-quarters of an inch in diameter. Its purpose is to let in light and allow the sun to color the apples so that they can be picked in a timely fashion. The grade, and hence the value of a red apple variety depends on its percentage of red color. In late July and August some varieties of apples ripen and are ready to harvest. The early varieties are often very tasty but are not good long term keepers so they are picked, packed and marketed immediately. The intense flurry of activity usually lasts about a week and a half for each variety and serves as a good dress rehearsal for the main harvest.